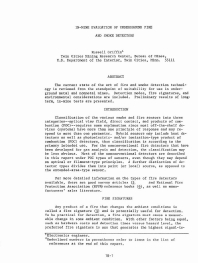 The current state of the art of fire and smoke detection technology is reviewed from the standpoint of suitability for use in underground metal and nonmetal mines. Detection modes, fire signatures, and environmental considerations are included. Preliminary results of long-term, in-mine tests are presented.